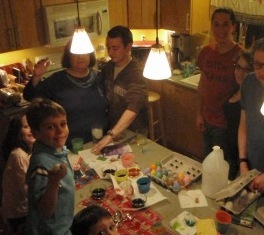 One of my favorite Easter egg decorating memories was from a few years ago. My kids were all excited about decorating eggs but insisted we wait for the rest of our family to arrive so that we could create together. As a lot of family get togethers go, everyone has busy lives and getting us all together for a coordinated plan is a very big deal. This Easter was no different in fact it was more complicated due to college schedules (of my brother, sister and her boyfriend) and job schedules. We hustled around and were all so excited to see each other we got a little lost in time. There was catching up on everything, eating, talking more, tickle fights between Aunts, Uncles and my kids and before you knew it, it was 11pm. And that would have been fine except we hadn't colored eggs yet. Us adults, would have been ok without decorating eggs but my kids were a whole different story. So, in typical fashion, my family gathered together to make everyone feel happy. We pulled out the vinegar and the PAAS box and before you knew it, we were elbow deep in stained fingers. If you look closely, you can see our clock that reads midnight I believe. The upside to our late night decorating of course meant that everyone would also sleep in the next morning....including the Easter Bunny. Easter is a month from today...what a perfect time to stop by the Lapin Market and find those so sweet and unique treasures to fill your one of a kind baskets! We're open tonight 5-8pm, Friday 11am-2pm, Saturday 10am-4pm and Sunday 12pm-4pm. Hop, Hope to see you there!